BOULDER, CO and TOKYO, JAPAN--(Marketwired - October 27, 2015) - OpenStack Tokyo Booth #S12 - SolidFire, the #1 Solid-State Array, today announced that Excite Japan Co., Ltd, a leading Internet information services provider, has selected SolidFire for its OpenStack-based next-generation virtual infrastructure. Over time, Excite plans to gradually migrate all its services to SolidFire's all-flash scale-out storage platform. SolidFire's integration with OpenStack, along with its ability to consolidate multiple workloads and guarantee performance, led Excite Japan to work with SolidFire partner ITOCHU Techno-Solutions Corporation (CTC) to implement this solution. Excite Japan Co., Ltd. provides a wide variety of internet services including internet portals, blog platforms and smartphone applications -- all of which require 24/7 support with zero downtime. Excite selected SolidFire for its OpenStack-based next-generation virtual infrastructure in order to improve reliability and better manage and guarantee performance with SolidFire's guaranteed Quality of Service (QoS). In today's agile business environment, the combination of SolidFire's all-flash storage infrastructure with OpenStack makes it possible for Excite to reduce overall cycle time from development to release. Previously, it was necessary for the infrastructure division to create distinct release environments, but through its complete integration of SolidFire's REST-based API with OpenStack, developers are now able to create it themselves. Takashi Fukuda, Infrastructure Division, Excite Japan Co., Ltd. said, "This change has enabled the development team to focus more time and resources on development work and freed up the infrastructure division to focus on system stability and efficiency. As a result, we have been able to accelerate our business." 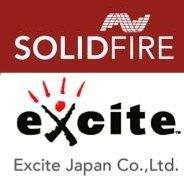 Excite Japan selected SolidFire for three key reasons: scalability, high cost-performance ratio and deep integration with OpenStack. In Excite's business, there are frequent changes to the infrastructure environment, making it difficult to forecast future requirements. SolidFire's ability to easily and flexibly scale-out by adding performance and capacity resources as business needs dictate was essential. In addition, SolidFire all-flash storage has delivered a 20X storage performance improvement at a similar cost compared to disk storage and enabled Excite to reduce the overhead for its virtualized platform. Due to SolidFire's involvement in the OpenStack community and proven expertise in this area, Excite was confident in working with SolidFire on its first OpenStack deployment. "As IT leaders prioritize financial and business value as key performance metrics, innovative enterprises in Japan, like Excite, are investing in OpenStack and SolidFire to transform their data centers and power their cloud environments," SolidFire's Managing Director, Asia Pacific & Japan, Kris Day said. "SolidFire is the only block storage built from the ground-up for the most demanding OpenStack environments, delivering guaranteed performance, high availability and unsurpassed scale for Excite's cloud infrastructure." The presence of SolidFire's Active Support capabilities in the Japanese market was also a key factor in Excite's decision. ITOCHU Techno-Solutions Corporation (CTC) has considerable OpenStack experience evaluating and deploying a broad variety of OpenStack solutions. Mr. Fukuda added, "ITOCHU Techno-Solutions Corporation and SolidFire are very proactive and well-versed in OpenStack, giving us the confidence that they can support our business in Japan." "CTC's expertise in building large-scale private clouds that leverage virtualization and orchestration technologies, like OpenStack, played a key role in deploying SolidFire's proven, trusted storage platform to meet Excite Japan's demanding infrastructure requirements," said Hirotoshi Ueno, Cloud Solution Planning Department, CTC. "We will continue to provide local technical, commercial and operational support as Excite expands its SolidFire storage system to meet business demands and deliver more value to its customers." Learn how SolidFire is purpose-built for the most demanding OpenStack environments by visiting SolidFire's booth (#S12) at OpenStack Tokyo 2015, 27 - 29 October. Read about SolidFire's SF Series storage platforms, which start at 35TB of effective capacity and deliver guaranteed performance to every workload. Download the 2015 Gartner Solid-State Array reports and read why SolidFire received the highest score for overall use case in Gartner's 2015 Critical Capabilities for Solid-State Arrays¹ (3.6 out of 5) and was again recognized as the Leading Visionary in Gartner's 2015 Magic Quadrant for Solid-State Arrays². Excite Japan Co., Ltd. is a Japan-based company mainly engaged in the provision of Internet-related services. The Company operates in two business segments. The Advertisement and Accounting segment is engaged in the operation of portal Websites and the delivery of content. The Broadband segment is involved in the provision of Internet access services, among others. Established in 1972, ITOCHU Techno-Solutions Corporation provides advanced IT solutions to enhance enterprise network systems and offers various outsourcing services, such as operations of its own data centers. ITOCHU Techno-Solutions Corporation supports such market segments as telecommunications, broadcasting, finance, retail, distribution, manufacturing, education, government, medicine, pharmaceutical, chemicals and apparel. ITOCHU Techno-Solutions Corporation has formed partnerships with hundreds of leading IT companies from all over the world. These partnerships range from those with global multinational IT companies to those with highly focused venture businesses. Approximately 8,000 people work for ITOCHU Techno-Solutions Corporation throughout Japan, and our service edge lies in offering one-stop, 24x7 support in approximately 100 service centers.